If you're new to the city or taking the T in from out of town, this is where you can get advice from people living in The Hub. Please keep discussion limited to things in and around Boston. Happy to serve the community for five years now, here is the long awaited weather post for 2019. Like past years, this thread is strictly for weather or weather related post. Unlike past years though, I am still debating if I will be going this year because of what happens in Massachusetts in April. Yup, this year's Anime Boston will be in School Vacation Week, where all public schools throughout the state will be closed. That also means that Anime Boston will be on the same week as the Boston Marathon. I don't think the con is on the same weekend as the Boston Marathon. The convention makes it a point to avoid being the same weekend anymore. The Boston Marathon is on the 15th, so it's the weekend before AB so it shouldn't be interfering. Which is why I said the same week, not same weekend. Anyway, the point of mentioning this is because it is still within Massachusetts School Vacation week, which means the city, and MBTA Subway, will be full of tourist. It is Easter Weekend so be sure to keep that in mind. I love it when the Weather Thread pops up. Here we are in mid January, and in one week, we have hadd snow, ice, rain, subzero wind chills; and then temps in the 50s and torrential rain. New England: where all the Pegasi and weather spirits are insane. Accurate. Honestly, so long as we don't get sleet again, I'm happy. I got so sick after that AB because of walking in the sleet in cosplay. Yep, down here in RI, it's like 15-25 degrees but then as soon as precipitation comes by, it jumps up into the 40s/50s and rains. We haven't had any snow so far except for like two inches from that "winter storm" a week ago. I know what a pegasus is, but I'm puzzled by the context of the reference here. Would you please be so kind as to explain? Anyway, good news is coming soon for those watching the weather. Oh, did I mention the good news is for snow lovers! That is due to the way the walls are arranged around that courtyard. As the various buildings went up around it, they accidentally built a vortex generator. February 5th 2019 had temps more proper for April. Let us hope that, in actual April, we don't get February temps. That explains it. Also, it's really nice to be in during the heat waves of summer. Hell, even weather forecasts 5-6 days out are wildly varied and inaccurate. Can't tell you how many times I saw "Heavy snow 7-10 inches" at the end of a 7-day forecast, only for it to change to "mostly cloudy" the next day. As is stated yearly - It is Winter in New England - a region historically known to have weather patterns from minus zero & blizzards to 70's & humid - all based upon weather patterns. Pretty much the same advice given every year: Plan to be outside in cold, wet & windy weather. Don't put your head in the sand & expect to remain indoors 100% of time as that is not possible nor guaranteed at a public event. Public safety & large scale pedestrian management will occur through whatever space is available, as required by the city/state/federal police. In summary: check the weather for best chance 3-4 days prior & bring 1 set of outdoors shoes & jacket/hat/gloves. Your health thanks you. Hello, for the first time in 12 years of going to Anime Boston, I will not be attending this year, I want to be with my family for Easter after missing it so many times going to this con. I believe the weather is warming up and since it's not in March this time, I think it will be fairly decent during the con weekend. High 50s and most likely gets cold in the morning and evenings. Enjoy yourselves, see you maybe in AB2020. AB11 Mio Akiyama from K-On! 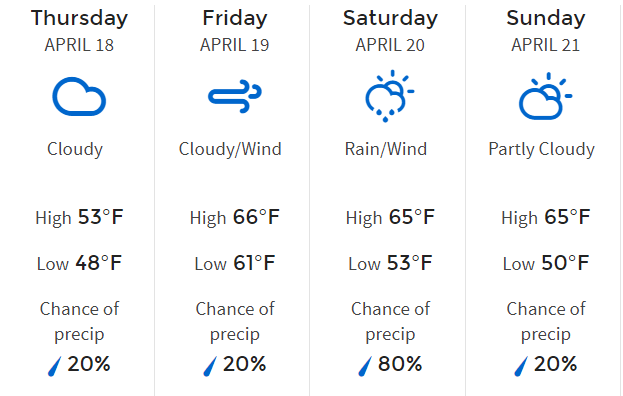 One weather site is telling me its going to rain all weekend while another is saying the weekend is going to be in the 50's-60's and partly sunny. Hopefully the 2nd site is more accurate! Yeah, looking at 7 day forecast right now, the highs are all in the mid 50s. So I imagine next week will be mostly the same unless we get some kind of cold spell. But again, 7 day forecast, take with a big grain of salt. 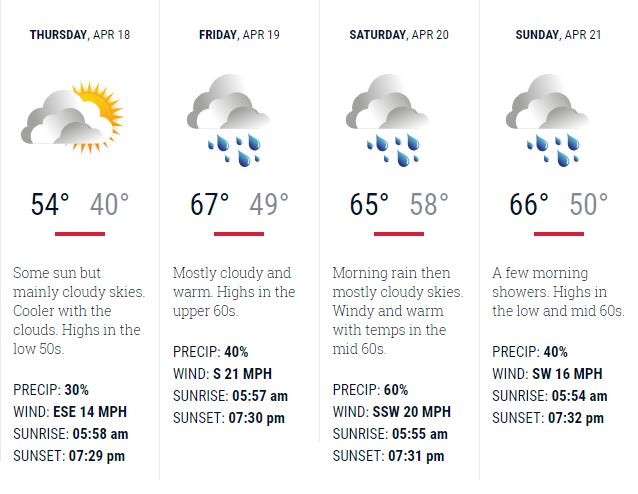 4 days away, looks like it will be cloudy but without rain, and above 60 degrees. https://www.wcvb.com/weather#weekend-forecast is saying for Boston: 20% Thursday, 40% on Friday, 80% on Saturday, 40% on Sunday. I check it for my town (halfway between Boston and Providence), and it says 10% Thursday, 60% on Friday, 90% on Saturday, 20% on Sunday. I had Darksky set to "Boston MA" which put it at "1 Congress St, Boston, MA". Switched it to the zip code over near Hynes (both 02116 and 02115 are on either side of it) and the forecast didn't change. Checking other weather sites, they all say "rain / light rain" for both Friday and Saturday, with varying chance percents. So yeah, bring an umbrella just in case, I suppose. We are now in the home stretch for Anime Boston. 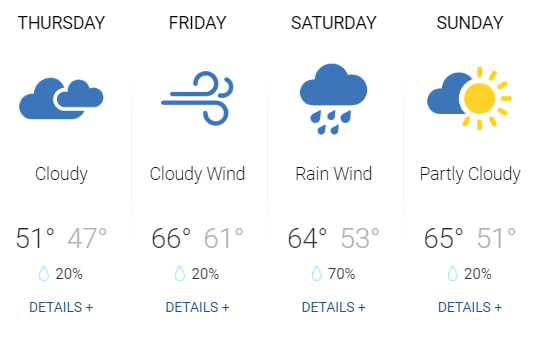 As of now, it looks like Friday/Saturday will be the wettest days for this year's convention. In fact, this may become the wettest convention since it started. Anyway, it is still days away so take this info with a grain of salt. Note: Due to the vast scope of The Weather Underground Network, sources from NECN, The Weather Channel, and Intellicast were not included as they have the same data as NBC Boston. Don't forget about global warming. I live outside Boston. The winters have been getting warmer. We haven't gotten snow after the flowers started growing in a long time. Badge name THX1139 not cosplaying. Two days away, looking like the rain might just be overnight between Friday and Saturday. Windy, and mainly cloudy. Highs in the low 70s and lows in the low 60s. Windy with periods of rain. Highs in the upper 60s and lows in the mid 50s. Cloudy. Highs in the low 60s and lows in the low 50s. I’m at the Con now. Overcast no rain. Need a jacket or sweatshirt outside. Hahaha, heading there in a few to pick up the badge. Lookin' like it's just going to be cloudy all day Friday with maybe some scattered very-light rain. Good grief that wind was insane walking between Star Market and the Westin late tonight. It sure was wicked windy.